Edgewood Bath and Tennis Club offers many great recreational programs for kids and adults to improve their sporting skills and fitness – while having lots of fun! With top level coaches and flexible sessions, there’s the perfect program for everyone at Edgewood. Looking for a few hours to get some errands done or have some time for yourself? Keep your child active and entertained by signing up for Summer Camp. 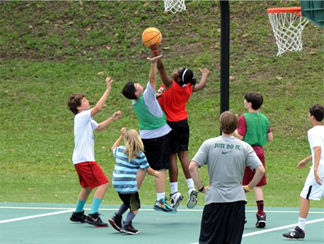 Each day of camp follows a different theme and includes fun games, lunch, and pool time. There is a minimum of 8 children needed for Summer Camp to be held and a maximum of 30 children, so please do not wait to sign up. Pickleball is a sport in which two, three, or four players use solid paddles made of wood or composite materials to hit a perforated polymer ball, similar to a wiffleball, over a net. The sport shares features of other racquet sports, the dimensions and layout of a badminton court, and a net and rules similar to tennis, with a few modifications. Pickleball was invented in the mid 1960’s as a children’s backyard pastime but quickly became popular among adults as a fun game for players of all levels. Pickleball courts are available now. Register at the front desk and play pickleball all summer long! Private lessons: $30.00 per hour. Round Robin Tournament. $25.00 entrance fee per person. A high energy in and out of the pool work-out modified for all ability levels. Must be able to swim 25 yards. Saturdays at 8 am – 9 am $10 per class. **We ask that all party guests bring their own towels. Every person staying for the party, including children and parents, count as party guests. Members are free (except for food). Food selections include: hamburgers, hot dogs, grilled cheese, chicken fingers, and french fries. Please note there is a strict. 24-hour cancellation policy for private lessons.